In this 10th Year Celebration of the Anatomy of Brokenness Series we will take a fresh look at "Wholeness. "Many are distracted in search of what they believe will make life better for them: people, relationships, experiences, and jobs - only to soon discover the issue was never about happiness, prosperity, or satisfaction, but wholeness. This is the great need of us all. In the Bible, the word whole is often used to describe Jesus' work of physical and emotional healing. When the Lord encountered a man, who had been an invalid for 38 years, He asked him, "Wilt thou be made whole? (John 5:5-6 kjv). 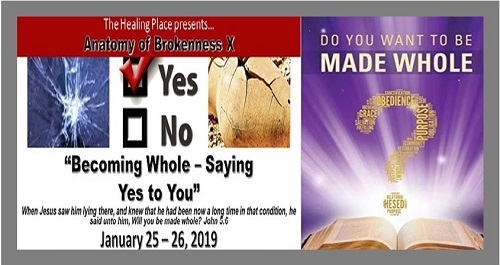 After Jesus healed the man, He challenged him to also embrace spiritual wholeness: "See, you have been made well" (v.14). Maybe you or someone you know is searching, looking, and hoping the next experience will quiet the rustlings of their soul, or fill them with happiness and contentment. Wholeness is what we need. How to find it, how to live it and become more whole in all the places of our lives will be the focus of our time together. • The Power of "Purpose"
• The Purpose of "Place"
• The Place of "Agreement"
Access the full seminar brochure here.